A stone plaque in the left hand wall of this church indicates that it was consecrated in 1192, which makes it one of the oldest in Cortona. The church of San Cristoforo in fact stands in the oldest part of town, at the crossing between Via San Niccolò and Via dell’Orto della Cera, where there stand also a number of other Medieval buildings. The inscription on the plaque probably dates from 1705, when the demolition of an ancient altar unearthed documents from the 12th century. 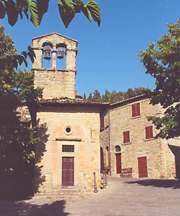 The Romanesque design of the church is clearly visible in the small bell tower, although following damage from a severe earthquake in 1575, which damaged also the precious frescoes in its interior, the church underwent renovation. An attempt to salvage what remained of the frescoes was made during the most recent restoration works, in 1960. Today the left hand wall of the church is in fact still adorned with a large 13th century Umbrian School fresco depicting the Crucifixion, the Annunciation and the Ascension. The choir gallery above the entrance to the church also contains an 1856 Giovanni Banci (1803-1874) organ, which was renovated in 1978 by the Soprintendenza di Arezzo and remains today the only surviving example an instrument designed by this great organ-maker.